This week on The Planner, I’m bringing you lots of options for your Mardi Gras celebrations. Some are kid-friendly; some are for the adults, but all will get you in the New Orleans spirit. The Project Room in Norman hosts the Mardi Gras Parade Fundraiser on Friday at Norman’s 2nd Friday Circuit of Art. Prepare yourself for the parade by painting face masks and tasting the winning Zydeco gumbo from Midway Market. Midway’s gumbo swept the January gumbo cook-off, winning the Queen’s Choice, Voter’s Choice, and the Bodacious Bling Awards. “Meet Me on Bourbon Street” is this Saturday evening from 6:00 to 9:00. The annual Jazz in June fundraiser brings people together for a night of NOLA-style festivities and fun at the Shevaun Williams & Associates Studio in Norman. This year, Odette and Andy Horton will join the party to share their memories of New Orleans and Carnival. The couple reflect on their years spent absorbing the food, music and attitudes that have crafted the unique culture of the so-called “City Beneath the Sea.” There will also be a formal announcement of the 2013 musicians performing at Jazz in June. Joy’s Palace is catering the event with gumbo, dirty rice, and other classic food from The Big Easy. Because of the nature of the event, attendees must be 21 or over. 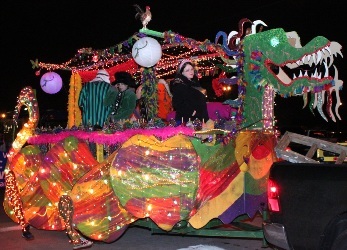 If you have little ones but still want to celebrate the weekend, the 19th annual Mardi Gras Parade begins the same evening at 7:00 p.m. Jugglers, Civil War reenactors, and several live bands are only some of what to expect marching through the streets of downtown Norman. Joseph “The Gumbo Man” will be there to relieve hunger pangs. Grab some beads; eat some gumbo, and viva le bon espirit! After attending the parade and/or Meet Me on Bourbon Street, it may be useful to take a few days off and recover from The Big Easy spirit. After all, Fat Tuesday is just in a matter of days. The University of Central Oklahoma is celebrating this day of overindulgence with a Fat Tuesday concert. The 5th Street Jazz Collective performs traditional New Orleans jazz compositions, some dating back over 100 years. The concert begins at 7:30 in the UCO Jazz Lab. To learn more about the times or locations of these events, visit our calendar page.